Amaltea, a half-elf ranger, has had many adventures and has made many friends all over this alternate world. Here you will find many of her friends. I wish to thank everyone involved with the stories behind these portraits. As the yellow waxing moon set upon the eastern horizon, there stood a lone figure on the highest balcony in Rhian. Wrapped in a flowing white cloak, trimmed with crushed blue diamonds, to protect him from the bone-biting cold of the winter night, Lord Khyle Deathbringer the ruler of Rhian, high priest of Cay, the second son of Khyron Deathbringer, peered out into the distance. Shaking his head Khyle slowly shifted his thoughts to his early years. On a perfect summer night of the third cycle, in the year of the Stag that Khyle was borne into this world. Being the second son, Khyle was sent to the monastery to learn the teachings of the Gods. At a young age Khyle's tutors found that he was naturally talented in the fields of mystical lore and physical combat. 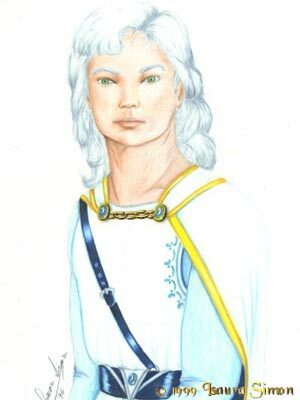 Soon after mastering all the knowledge his tutors could give him, they sent him to the city of Elanthia to learn the ways of Cay, the God of Combat. With a deep sigh Khyle shook himself out of his revorie and turned away from the balcony. Walking back into his bedchamber, Khyle whispered under his breath, "Another night and still no news." As Khyle walked over the threshold, a mellow baritone voice echoed out of a shadowed corner, "Still no word from the east?" Khyle replied, shaking his head slightly, "It has been 3 months since I sent out messengers to Teras isle to find my wife, and not one of them have returned." Walking over to the fireplace Khyle adds, "I'm worried Chadric." "Dont be worried brother, I know Amaltea, and she is quite capable of taking care of herself." responded Chadric. "She is probably having a great time as we speak, finding new places to get into trouble." "That's what's bothering me!" Khyle quickly retorts. "Khyle, soon my magical portal will be finished and then we will be able to travel to Teras isle in a flash. Until then lets just relax and keep each other company." Chadric replied trying to sooth his younger brother's fears and anguish. "Remember the time when father took us out fishing on the lake?" "Yes, I remember. You almost drowned! Mother was upset with father for weeks." chuckled Khyle. The door opened as a young page entered the chamber. "Yes, what is it?" inquired Khyle. "A messenger has just arrived with a lettter from your wife, my lord." stammered the page. "Bring it here so I can read it, Julius." Khyle replied hurriedly. Khyle knuckles whitened as he read the letter silently. "Whats wrong?" asked Chadric sensing something was wrong by the look on Khyle's face. Finally, after a few moments Khyle tossed the letter to his brother, "you read it." Chadric picked up the letter from the ground and started to read. Jumping out of his chair, Khyle exclaimed, "Julius, run to the stablemaster and tell him to ready our horses, NOW!" Walking over to the chair where Chadric was sitting, Khyle asked "Are you coming?" With a nod of his head and a grin, Chadric replied, "I wouldn't miss this for the world." Chadric stood up and handed Khyle his falchion that was resting against his chair. Scowling at Chadric, Khyle grabbed his falchion and belted it to his waist as he stormed out the door. Site design and layout © 2006-2019 Isaura Simon. The artwork displayed on this site, unless otherwise noted, remains the property of Isaura Simon and cannot be used without her permission.